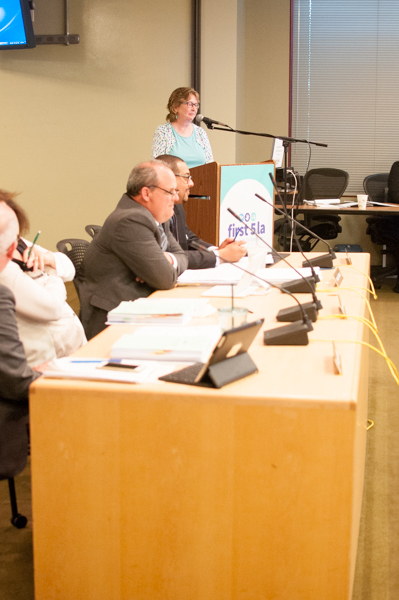 Two significant changes to the First 5 LA Board took place in May: Commissioner Suzanne Bostwick retired from her four-year role as a Board alternate and Brandon Nichols launched his role as a First 5 LA alternate Commissioner. During her years of First 5 LA service, Bostwick filled in for past Board member Dr. Jonathan Fielding and current board member Cynthia Harding, who serves as Interim Director of the Los Angeles County Department of Public Health. Bostwick will also be retiring from her work as the interim director for Maternal, Child and Adolescent Health Programs (MCAH) for Los Angeles County Department of Public Health, where she has worked for 25 years. MCAH is responsible for planning, implementing and evaluating services addressing the health priorities and primary needs of infants, mothers, children and adolescents in L.A. County. 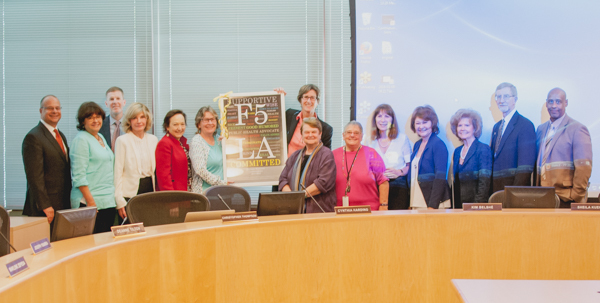 Bostwick’s service was applauded by First 5 LA leaders and other Commissioners at the agency’s May 12 Board meeting. “I know you made an impact on many First 5 LA projects,” Board Chair and Los Angeles County Supervisor Sheila Kuehl told Bostwick. “You have been a terrific advocate for young children and will be missed,” said First 5 LA Executive Director Kim Belshé, who heard that some staff were “devastated” by Bostwick’s departure. “I will probably have to start a support group.” Belshé added, wryly. Despite her departure, Bostwick said she may continue her involvement in helping children. The Los Angeles County Department of Public Health has not yet named a replacement for Bostwick as their First 5 LA Commission alternate. Meanwhile, a new alternate Commissioner has been appointed by the Los Angeles County Department of Children and Family Services (DCFS) to the First 5 LA Board. He will serve as an alternate for Commissioner Philip D. Browning, who is the Director of DCFS. Nichols is Chief Deputy Director for the L.A. County Department of Children and Family Services. In the more than 16 years he has been with the County, he has worked primarily in the areas of foster care, adoptions, and mental health programs as both an attorney in the County Counsel’s Office and as an administrator at the Department of Children and Family Services. He has also played a significant role in recent efforts to provide enhanced mental health services to inmates throughout the County jails.